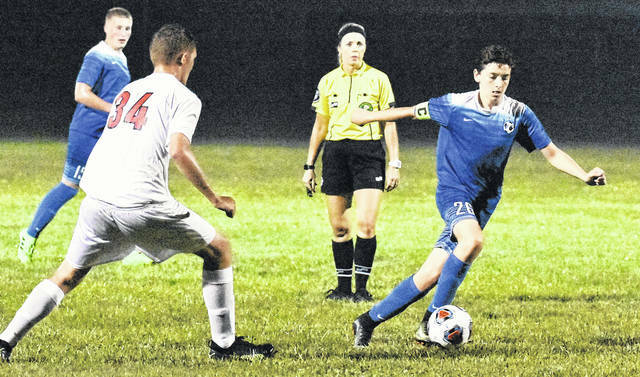 GAHS freshman Brody Wilt controls the ball during the Blue Devils Ohio Valley Conference contest against Portsmouth on Sep. 13 in Centenary, Ohio. GAHS senior Gretchen McConnell controls the ball during the Blue Angels match versus Piketon on Sep. 13 in Gallia County. A dozen reasons to be excited for the GAHS soccer program. 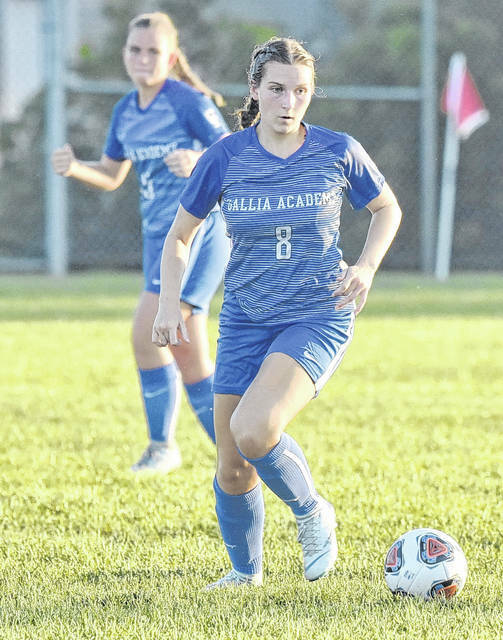 A total of 11 Gallia Academy soccer players — six girls and five boys — were chosen on the the 2018 All-Ohio Valley Conference soccer teams, as voted on by the coaches within the league. The Blue Angels went undefeated (8-0) in the conference en route to their first-ever OVC championship and led the way in postseason honors with six selections. First-year Gallia Academy coach Leah Polcyn was also chosen as coach of the year in the program’s first year of existence. Seniors Gretchen McConnell and Trinity Eggers were joined by sophomores Kaylie Clark and Koren Truance as first team selections. The quartet were joined by GAHS freshmen Preslee Reed and Kyrsten Sanders who were chosen as honorable mention selections. Fairland followed with five honorees, while Rock Hill, South Point and Chesapeake each finished with four selections. The Blue Angels finished the season with a 12-4-1 overall record in its inaugural season. For the Blue Devils, senior Pedro Moreno, junior Ian Hill and freshman Brody Wilt were each first team selections, while junior Andrew Toler and sophomore Bode Wamsley received honorable mention selections. Rock Hill led the way six honorees, while GAHS was second with five. Fairland, South Point and Chesapeake each had four choices, while Portsmouth concluded the list with three honorees. Rock Hill’s Luke Simpson was chosen as coach of the year, as he guided the Redmen to a 8-0-2 conference record. GAHS finished second with a league mark of 5-2-3. GALLIA ACADEMY: Brody Wilt, Pedro Moreno, Ian Hill. FAIRLAND: Mason Fannin, Lane Jordan. SOUTH POINT: Drew Smith, Luke Tyree. CHESAPEAKE: Cameron King, Andrew Miller. ROCK HILL: Victor Aguilera, Kaleb Kidd, Jake Blagg, Jackson Kidd. GALLIA ACADEMY: Jason Aguilera, Brady Floyd. FAIRLAND: Clayton Bloss, Zach Stewart. SOUTH POINT: Tyler Lilly, Jaylon Halfhill. CHESAPEAKE: Andrew Clagg, Ian Picklesimer. PORTSMOUTH: Joel Bowling, Jay Lend Thomas. ROCK HILL: Jasson Aguilera, Brady Floyd. GALLIA ACADEMY: Kaylie Clark, Koren Truance, Gretchen McConnell, Trinity Eggers. FAIRLAND: Erinn Hayden, Lexi Hall, Makenzie Kazee. CHESAPEAKE: Maddie McKee, Sheridyn Collins. ROCK HILL: Paige Bailey, Makayla Scott. GALLIA ACADEMY: Preslee Reed, Kyrsten Sanders. FAIRLAND: Carson Bailey, Maddie Miller. SOUTH POINT: Bridget Aylsworth, Kee Kee Montgomery. CHESAPEAKE: Kelsie Hegemyer, Emily Johnson. ROCK HILL: Lucy Simpson, Grace Stevens.